Track Cranes – Gorbel Inc. Depending on the kind, track cranes can be arranged to fit its surroundings, as to increase efficiency and productivity. The bottom flange (the hardware used to create secure connections when conjoining sections of pipes, tubes and other materials in transmission equipment) of many kinds of track cranes are unlike normal flanges, in that it has a raised tread suitable for rolling purposes. This design is intended for high-repetition operations, such as in most factories. A track crane is preferred for its precision, as well as its durability, and can handle both light and heavy loads for many years. The surface on the raised treads of the flange allows the crane to roll with ease. Because of this type of track crane’s free-running trolley, heavy, awkward items can be moved quickly and easily. Additionally, depending on the number of runways a particular track crane has, transport can happen throughout a very large space, as well as lift and position loads in otherwise extremely inaccessible areas, such as between pillars and columns. A variety of components in certain track cranes allow control of route, so as to better fit with the structural elements of a workspace. These kinds of track cranes can be mounted on walls or pieces of machinery, and can typically be dismantled and re-erected. Many track cranes are suspended overhead, which is appropriate for efficient handling and positioning of goods. 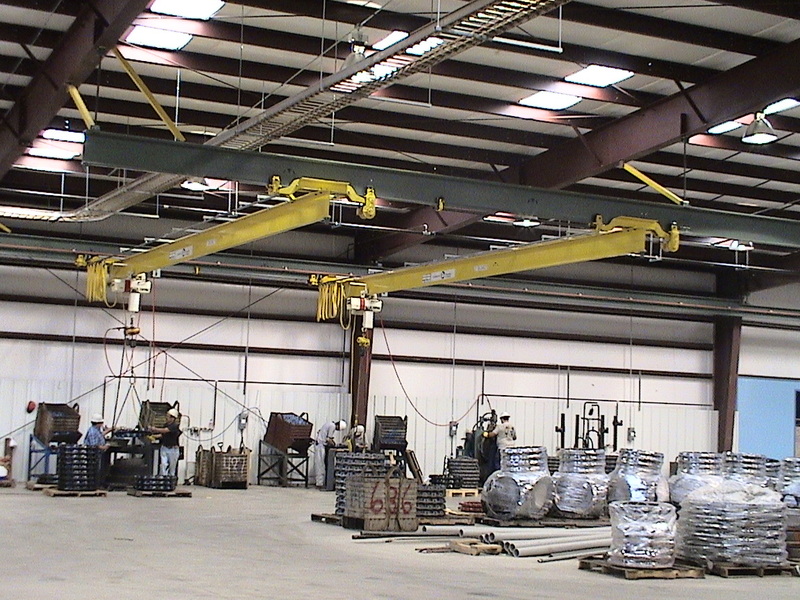 Suspended track cranes decrease horizontal pressures and offer protection from bending strains. In addition, the height of a suspended track crane can be easily adjusted via threaded suspension rods and ball joint heads. Such track cranes are similar to bridge cranes and both are used in many workplaces, like factories, warehouses and store yards, where heavy equipment and supplies are regularly moved from one place to another. Because track cranes generally do not rely on independent energy sources, like batteries or natural gas reservoirs, they, like bridge cranes, are a faster, cheaper and more efficient alternative to other transport tools, like fork-lifts and hi-lows. Track Cranes A track crane is a kind of machine used to lift and transport heavy equipment and materials by way of a rolling mechanism along a set travel path, or track. Track cranes are useful for handling loads quickly, safely and efficiently.